Happy Black Friday everyone. Whether you went shopping this morning, and are home now, or slept in…grab a cup of your favorite beverage and join me for some spinner inspiration today for the Paper Crafter Anonymous website. 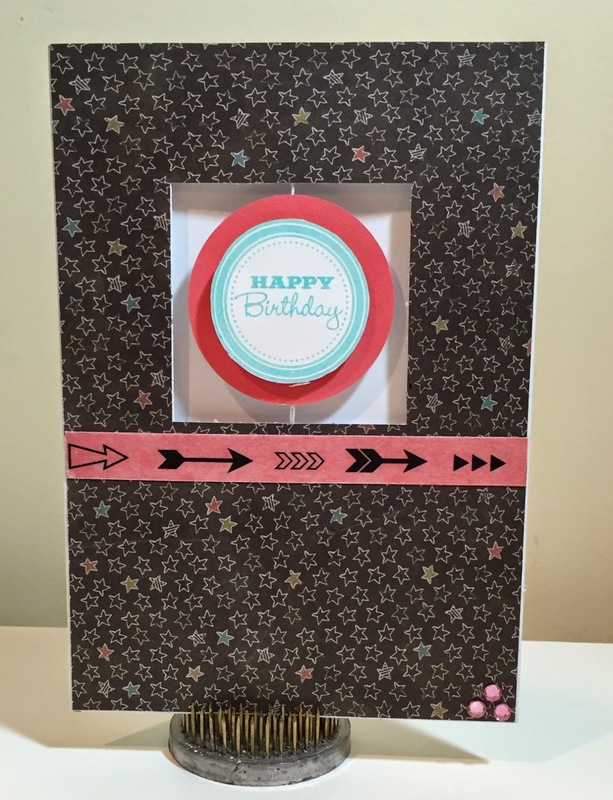 I started off with a spinner base and the chalk it up paper. This came together in no time. 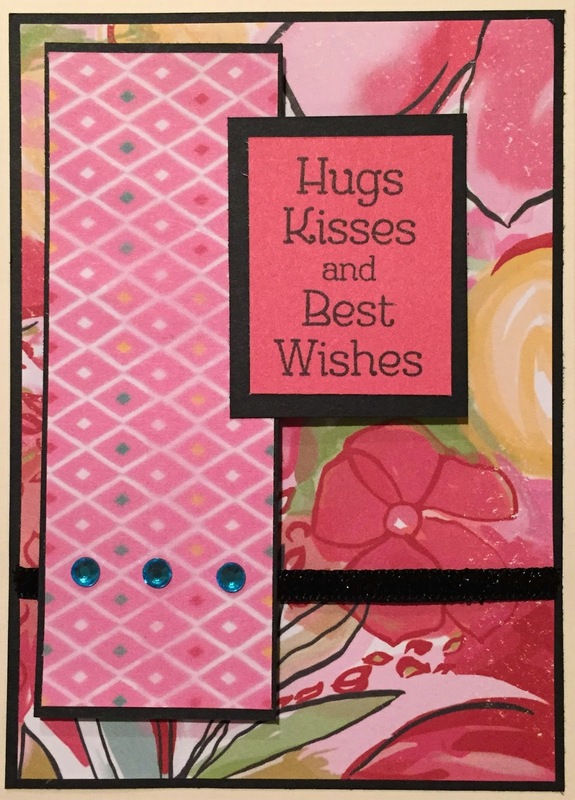 Some matching pink paper, washi and a stamped sentiment and it was done. The stamp set I used was Holiday Tags Occasions. The circle fit perfectly layered in the spinner. This set really is wonderful though. It has five different sentiment tags and fifteen different sayings. 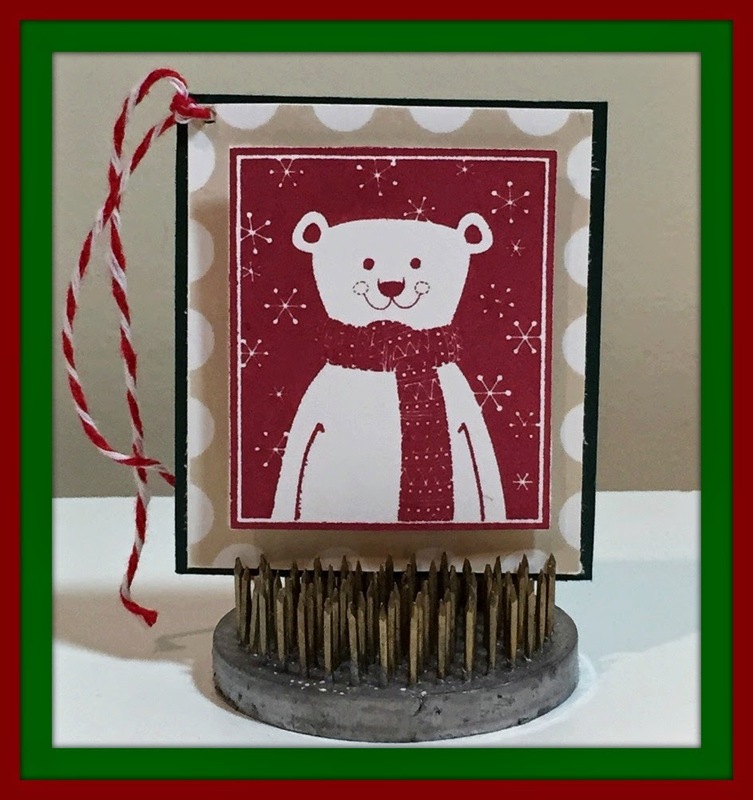 I used another one of the tags on my Christmas criss cross card seen here. I included a video of the spinner portion so you could see how adorable it is. Hope you’re inspired to sit and create something today. Until next time…Keep Scrapping! Hi everyone! Glad you’re joining me for my weekly Paper Crafters Anonymous post. I know we haven’t hit Thanksgiving yet, but I’ve already started thinking about Christmas crafts…have you? I started with making some tags. For our Christmas day packages I usually use pre-done tags since there’s so much activity, but I like to have a few handmade ones for things like neighbor gifts. I try to make our neighbors homemade goodies, and a handmade tags make them look even more special. 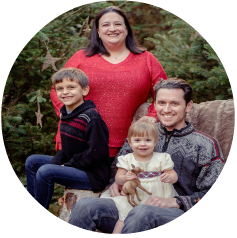 I used the October Stamp of the Month set…Home for the Holidays. You can pair this set with the Art Philosophy cartridge and it would cut all the tags out for you in their shapes. I went a different route though and cut the frame square so I could pop the polar bear up with dots to give him some dimension. Add a matching backing for stability – some twine for attaching to your package and you’re done in a snap. One tip on this adorable polar bear though…use a light touch when you ink the stamp. His details are so small that if I put to much pressure on the pad his scarf, and background, were just a colored blog. So tell me…what Christmas projects do you have planned? Have you started them yet? Until next time…Keep Scrapping! Since I did a male birthday card for Paper Craft Anonymous last week, I thought this week I would share a birthday card for the ladies. I pulled out a sketch from my pinterest stash to get me started. The sketch is from Sweet & Sassy stamps and it called for me to use it right away. I pulled out one of Close To My Heart Brushed papers and got right to work. I chose the black from the flower details for my matting to set the two papers apart. A black ribbon, a few gems and I was good to go. 15 minutes from start to finish and I had a beautiful card. Do you use sketches for your cards as well as your scrapbooks? I love how they spark my creativity. Until next time…Keep Scrappin! Happy Friday everyone. Thank you for joining me for another inspiration. We had a 5th birthday to attend and I chose to make a card rather than by one. I know making cards doesn’t always take ten minutes, but when cards have reached $4.99 to $8.99 I certainly try to fit making one in. This was the first time I tried to make my own background out of stamps. I chose the tire tracks, and the yellow washi reminded me of yellow road lines. The tracks also match the distressed shutter lines in the inspiration photo at the Pink Elephant challenge. 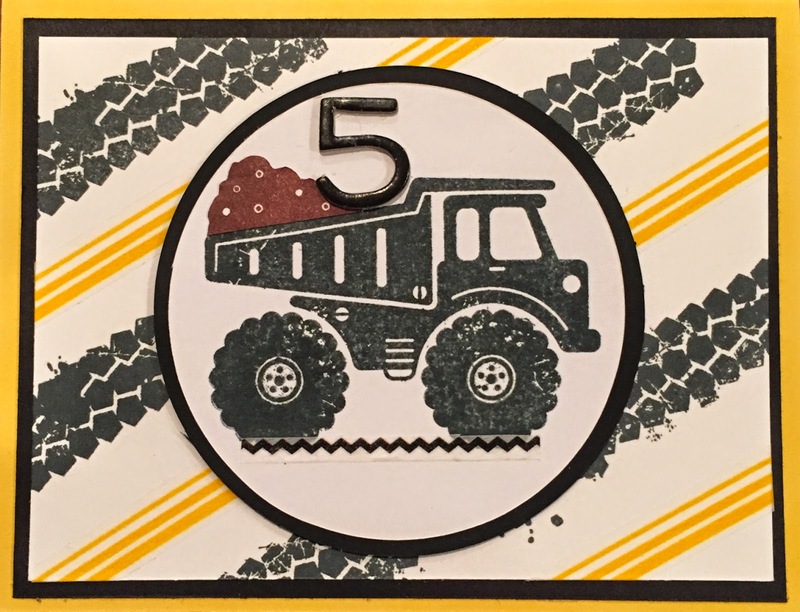 A dump truck, some dirt and the birthday number and I was ready to go. This card actually took only about 20 minutes to make, and I was really pleased with how it came it. It was a big hit at the party too. Welcome to another reveal for Paper Crafter Anonymous. I am playing with the papers from my recent haul. This is the Pathfinding paper as well as a few chipboard stickers and accessories. The banner and words are from Simple Stories. I loved this photo of my mom and son when he was about ten months old, but I didn’t want to overwhelm it with patterns since the background was busy. The orange leaf paper from the Pathfinding collection was just interesting enough. The heart banner behind the photo was actually the strip of paper you cut off the bottom of a 12×12 sheet. If you’ve followed my blog lately I’ve been loving finding ways to use these in layouts to extend the paper pack. I hope you’ve enjoyed what I’ve done with the paper. I’d love to see what you’ve done with the collection if you purchased it. Until next time…Keep Scrapping!